With half-a-century and five generations under its belt, the sixth-generation Camaro stands as a testament to its own enduring legacy. Offering the eye candy of its impeccably sculpted design, alongside iconic performance, the 2018 Chevy Camaro continues to embody the ideals upon which it was conceived fifty years ago. Discussion of nearly every Chevy offering is incomplete without praise for their inclusion of technology. Bluetooth-enabled for both phone and music streaming, the 1LS and 1LT trims feature Chevy’s MyLink infotainment system built around a 7-inch touchscreen interface (with rearview camera and six-speaker sound system. Offering satellite radio, and compatibility with both Android Auto and Apple CarPlay may be fairly standard, but the inclusion of 4G LTE WiFi connectivity remains one of Chevy’s strongest offerings in base trim levels. Stepping up to the 2LT enhances this further by upgrading to an 8-inch touchscreen and nine-speaker Bose audio system. With leather upholstery, ventilated (and heated) front seats the value of the Camaro (even at lower trim levels) speaks for itself. The 2SS trim provides amenities such as wireless smartphone charging, heated mirrors and steering wheel, as well as upgraded safety features. The inclusion of a head-up display, parking sensors, blind-spot monitoring and rear cross-traffic alert are all welcome inclusions in a performance car like the Camaro. Some features, such as the flat-bottomed steering wheel that it borrows from its Corvette stablemate, elongated luxury-inspired dash design and circular vents are retained through all trim levels. Other, such as the ambient lighting, performance gauge-cluster, and stitched-leather Recaro seating require enhancement packages or trim jumps. That said, the interior is welcoming and reflects continued refinement over previous model years. Exhibiting strong material choices, it offers a comfortable driver-centric design, with well-thought-out placement of controls made accessible for ease of use. And the interior of the ZL1 benefits from the features of every trim and enhancement package that came before it. Earlier, it was mentioned that parts of the Camaro felt more inspired by Italian design sensibility than domestic. The ZL1 is the ultimate realization of the Camaro’s upscale intentions, a sentiment which is especially evident within a dual-tone color scheme. Impeccably on-brand, the sixth-generation Camaro offers all the familiarity of its half-century legacy, albeit with a design so captivating that you’ll crane your neck to get a better look. Making a dynamic impression with its prowling, downward-sloping hood, the sculpted contours that run along its hood and side panels convey a sense of speed. As with so many great sports coupe designs before it, this sense of speed plays against the Camaro’s low, a wide stance which conveys power and aggression. Retaining the anti-Mustang sentiment it was conceived with, it looks nothing like anything else on the road. It is clearly a Chevy, and iconically a Camaro. The LS and LT trims may play it a little more safe by down-playing their performance-inspired aesthetic, but selecting the RS and Track Performance packages can remedy this, should you wish. It’s hard not to take notice of the Camaro ZL1, which is also available as a coupe or convertible. Making an immediate first impression its boldly-carved styling cuts a dashing profile. And with its gaping maw, wide-hips, and broad-shoulders, the ZL1’s dimensions reinforce the legacy of the modern Camaro’s low and wide design. It’s clearly the gym-rat of the bunch. The (newly-added) 1LS, 1LT, and 2LT trims are powered by a 2.0-liter turbocharged four-cylinder mated to a six-speed manual transmission (on 1LS and 2LT) or optional eight-speed automatic (standard on the 1LT). Channeling 275 horsepower and 295 lb-ft of torque, you can also opt for the 3.6-liter V6 engine which bumps those numbers up to 335 hp and 284 lb-ft, respectively. Riding on 18-inch alloy wheels, the (base) 1LS features adaptable driving modes which can tailor the Camaro for road or track-readiness, as well as to improve its suitability for various weather-influenced road conditions. The Camaro 1SS and 2SS are equipped with a 6.2-liter V8 mated to either a six-speed manual or (optional) eight-speed automatic. Channeling 455 horsepower and 455 lb-ft of torque, the Camaro sprints from zero to 60mph in 3.9 seconds, a 1.2-second improvement over the V6. Other performance-based enhancements include a mechanical limited-slip differential, Brembo brands, and a sport-tuned suspension. A supercharged 6.2-liter V8 paired to a six-speed manual (or 10-speed automatic) drives you back into your seat with 650 horsepower at 6400 rpm and 650 lb-ft of torque at 3600 rpm (which is exactly what you’d expect of the most powerful Camaro ever made). But what might be the most surprising feature of the Zl1 comes as a result of its transmission/ While traditional preference may be for the manual, the 10-speed automatic is deserving of the hype it receives, with shift times that rival the likes of dual-clutch Porsche and McLaren models. Impressive, to say the least. And if the impactful first impression comes as a result of its design, the lasting impression that it leaves can certainly be attributed to its throat-punch exhaust. Passers-by should brace themselves for a distinctively throaty note that is a perfect extension of the ZL1’s impressive performance stats. Priced to start around $25,905 MSRP, the Camaro remains an accessibly priced way to change the way you experience the open road. In fact, it’s fair to say that it stands as one of the most ambitiously styled vehicles in its price range. It may not be the first pick for an all-season vehicle, but it’s an affordable way to capture the attention of passers-by and passengers, alike. Continuing the momentum gained by its fifth-generation offerings (coming after a brief contemplative rest from 2003 to 2009) the Camaro races forward with its marriage of performance, styling and Chevy’s signature reputation for the inclusion of available technology. But since the 2018 offerings go largely unchanged from the previous model year, it’s important to recognize that the Camaro enjoyed a full redesign in 2016. With that in mind, the styling retains all the ‘newness’ of that refresh (which certainly contributed to its being named Motor Trend ‘Car of the Year’). But Chevy clearly refused to rest on their laurels, allocating both 2017 2018 to further refinement. The results speak for themselves. Named by Car and Driver as a ‘10Best’, the Camaro has been celebrated by Kelley Blue Book for its ‘Best Resale Value’ and has been named by J.D. Power and Associates as their ‘Most Dependable Midsize Sports Car’ a staggering five years in a row. That said, the 2018 Camaro has a strong foundation of award-winning excellence. 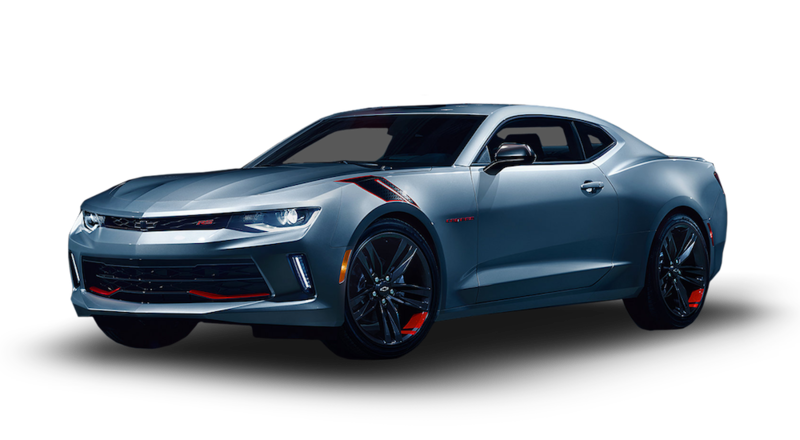 Whether you opt for coupe or convertible styling, the two-door (rear-wheel drive) Camaro is available in six primary trim levels (1LS, 1LT, 2LT, 1SS, 2SS, and ZL1) serving up four different powertrain options. But while all of them provide an iconic Camaro experience, each one provides its own unique take. To highlight both the similarities and the differences between each trim level, let’s break it down in terms of trim levels. Perhaps the greatest achievement made evident by the 2018 Chevy Camaro is that there appears to be a Camaro for everyone. From the more mild-mannered four-cylinder to the earth-shattering V8 of the ZL1 there is diversity to be explored by enthusiasts of all types and all budgets. Only more exciting these offerings, is the question of ‘where will the Camaro go from here?’.